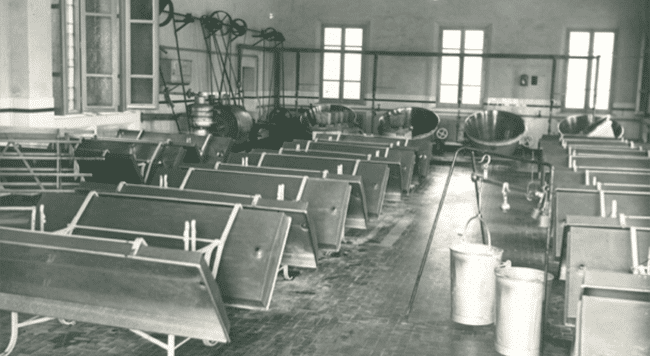 Our Dairy was born in 1904; throughout the tragedies of the two World Wars, it has been able to organize the work of hundreds of people granting respectable living and working conditions, even in hard times. During the years, the Dairy has been able to make the right investments that lead to a big Parmigiano Reggiano production growth. Together with the quantitative development of the production, the dairy always kept in mind a big priority: the quality of the product. This makes the Dairy an Excellency of the Parmigiano Reggiano’s territory. The company philosophy is in this sentence: “ you can produce cheese in thousands different ways but, if you want to do it in the best possible way you need experience, passion, reliability from the production of milk to its transformation, without neglect stock aging”. The headquarter of the Latteria Sociale San Giovanni della Fossa is equipped to carry out the whole production process and the cheese seasoning. An important restructuring plan for the installation and the dairy structure is in progress to ensure better production adopting new and more advanced technologies. In 2013 the Excellence Award of Production for 2010/2011 was obtained.